To: The Honourable Herb Dhaliwal, P.C., M.P. Thanks for your encouraging replies to my earlier correspondence. I remain very alarmed at the sad condition of our marine life. My biggest impression now is that THE POOR QUALITY OF THE SCIENCE available on the subject of the marine ecosystem is the most severe problem threatening fisheries today. “A sustainable approach to the resource” will never be achieved without a more accurate understanding of what makes the system “tick” - and all methods of resource management will become redundant once we have depleted all that can conceivably be eaten by humans or livestock. Do you appreciate the severity of the present crisis in scientific knowledge in marine biology? (The public certainly does not, nor do they understand the implications for everyone’s future...but that’s not my main point today.) The science of assessing, managing and predicting changes in fish stocks is rapidly falling apart - the “best available science” cannot explain the changes that are happening in the marine ecosystem today. The population models and management techniques that DFO (and marine scientists in other parts of the world) have been applying to “conserve” and manage fish stocks are proving to be less and less useful. It must be very frustrating. Lately it seems that their ability to predict trends in marine fish populations has been reduced practically to zero. 1. THE "3Ps" ATLANTIC COD STOCK STORY. I’ve seen no scientific explanation for this clear inshore-offshore gradient in fish survival today, but I can propose one: Inadequate nutrients are being returned to the ocean to replace the fish that we have been removing - the nutrients that do reach the sea get there primarily via freshwater runoff, whether they are from “natural” sources or human, and they are therefore available to fertilize or nourish the marine food web in nearshore areas only. That’s why 3Ps cod can “outproduce” the formerly huge offshore Grand Bank stock today. The inshore cod currently enjoy twice the life expectancy of the offshore ones. There has been one other Atlantic Canadian cod stock that has been able to rally slightly in recent years - the one in the northern Gulf of St. Lawrence - and again it’s down to better nutrient availability, in that case the proximity to the mouth of the river and the coast of Quebec. These inshore stocks are also severely weakened, but will survive somewhat longer than those further offshore. 2. THE BOOM IN CRUSTACEANS. 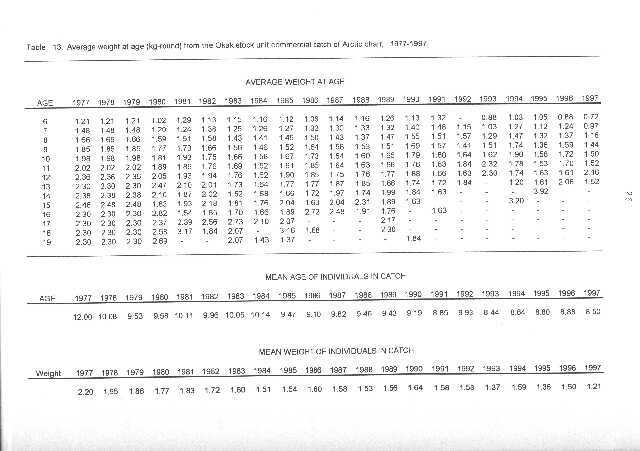 When groundfish abundance dropped in the 1960's after heavy exploitation, it doesn't appear that the age structure of the populations went into collapse (cod data tables from those years recorded fish up to 20 years old). Also the condition of fish seems to have increased rather than decreased at that time ("density dependent")...and unexploited species were not recorded as going into decline...and it did not result in a great boom in crustaceans...no, the 1990's are definitely not a repeat of the 1960's. "Hoping" for "stock rebuilding" like that which occurred 30 years ago...is far too likely to be in vain. ....Just maybe...the loss of the groundfish in the 1990s represents peeling off one layer, and when the crustaceans go into decline another layer will be removed. If my suspicion is right, and the whole system is being steadily forced down as the end result of all biomass extraction, then the future drop in the populations of crustaceans will definitely not be accompanied by a resurgence of the groundfish. Not a pleasant prospect, but it should be a possibility worth investigating all the same. This is encouraging; it’s refreshingly honest. One newspaper headline last December read “Cod Death Rate Baffles Scientists” (The Halifax Herald, Dec. 21, 2000, story by Alison Auld, The Canadian Press) Subtitled “Number of fish dying off N.S. has doubled in last decade,” the story reported on a news conference with the director of the Bedford Institute of Oceanography, Mike Sinclair. ...and seals cannot be causing the weight-loss trend in fish that I have previously pointed to, nor can they be causing the total eradication of the older year classes of fish. So it is now obvious that the cod need something more than a “reprieve” from fishing to recover (although that was certainly essential.) Mr. Sinclair hinted at what else is needed when he described “a lot slinkier, skinnier fish and in worse condition” - those are the clear signs of malnutrition, the other thing that the codfish need is FOOD. The increasing natural mortality in the cod stock that was reported in the press - is accurate, but does not tell the whole story. “Mortality” has been inexplicably rising in ALL groundfish - check the Stock Status Reports from DFO, or the publications of the FRCC. The reason that fish size is no longer “density-dependent” and the explanation for many of the other recent “surprises” in the marine ecosystem is this: A fundamental error was made in assumptions about how the system works, and the error was made early in the development of fisheries science, and incorporated into the later thinking. It was ASSUMED that an unlimited reserve of raw materials exist in the ocean to replace fishing removals - hence “species replacement theory” and “the total biomass will always remain the same/it’s just a ‘regime shift’” sorts of ideas. What has happened is that fishing (overall) has interrupted the marine nutrient cycle (a living system that depends on constant recycling of nutrients). The effect has been cumulative, and now sea life forms - more acutely those living at the higher trophic levels, like bigger fish - are suffering from a shortage of available nutrients. (Evidence? - there are now very few of them and they are in poor “condition.”) The implications of this are very serious since any and all fishing will ultimately worsen the overall problem...is that a reason to ignore it? Whether or not we “like” a theory is irrelevant - all that matters is if it can accurately explain and predict changes that take place. 5. THE NEED FOR RESEARCH IN NEW DIRECTIONS, INCLUDING A FEW CONCRETE, CONSTRUCTIVE SUGGESTIONS. As you are aware, I have spent the last few years conducting my own “freelance” research into the problems with the fish stocks. My original work that I sent to you last year (“Wake Up and Feed the Fish! A New Insight into the Causes of the Collapsing Fisheries”) described the situation as I saw it. I tried to show how the trends that are occurring seem to support a new explanatory theory - overall biomass depletion in the sea is the cumulative end result of fishing - and the steady biomass drop is now a major “forcing mechanism” driving many of the changes that we are seeing in the marine ecosystem today. What needs to be done now, and what I have been working on, is this: a critical look needs to be taken at all of the other explanatory theories that are being used today. This list includes overfishing, climate change, pollution (nutrient and chemical), habitat destruction, increased ultraviolet radiation, excessive predation by seals, “size-selective culling has induced slow growth in fish” and “species replacement occurs in the sea, keeping the overall biomass steady.” The strengths and weaknesses of each theory (and combinations) need to be objectively described, and then today’s theories need to be held up against today’s trends to see how well they fit - i.e. their ability to offer plausible explanations, and also their ability to accurately predict developments. So, Mr. Dhaliwal, mortality of young adults now clearly exceeds juvenile mortality as a threat to cod. That’s my observation and surely it should inspire a few new research questions. The recent big “skate story,” however, has been the virtual extinction of the barndoor skate. Like the others, it has been frequently caught as an unwanted bycatch in fisheries. But for some reason the barndoor skate has found itself much more vulnerable to depletion by this method than it’s cousins. The range of the barndoor was as wide as the others, and it was not “rare.” In 1966 it was described as “very common at Tignish, PEI, frequently at Canso, N.S., and along the Nova Scotia coast, all parts of the Bay of Fundy and St. Mary’s Bay...offshore at Banquereau and Sable Island Bank...to the southern edge of the Grand Bank...” What sets the barndoor skate apart from the other skates? It is mainly size - the barndoor is a remarkably larger skate than the others. It used to grow up to five feet wide. Does any evidence exist to support the idea that the barndoor skate is disappearing because of starvation? As much as I would like to, I do not expect to find statistics on “condition factor” for the barndoor skate. Perhaps, however, some clue can be deduced from a comparison of pictures of this animal. 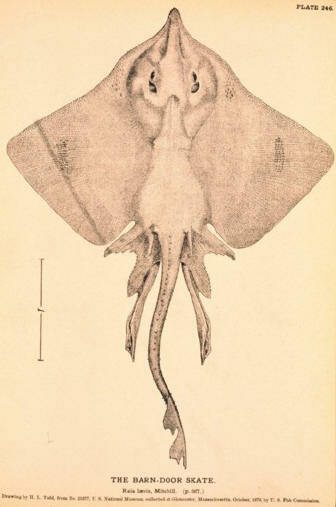 Not a “scientific study,” to be sure, but illustrations of the barndoor skate that were done decades ago (this illustration from NOAA's historic collection - at least 100 years old) show a noticeably plumper mid-section than one I found that was done in the 1990s. The later sketch gives the impression that the fins are getting bigger...but of course it is the same illusion that can be seen in other severely stressed fish species (e.g. the basking shark - see illustrations on the bottom of my home page)... the fins are the same size as ever, it’s really the body of the fish that is getting smaller. My conclusion is that “fishing down the web” has proved to be too big of a challenge for the barndoor skate. “Size-selective culling?” Yes, it has occurred within the family of skates...and it cannot be due to “fishing methods” in this case - they all ran the same risk of perishing as “bycatch,” size-selective culling is the result of size-dependent feeding patterns. The big ones starve first. So, if the disappearance of the bigger fish cannot confidently be blamed on overfishing (on a stock by stock basis as it always seems to be interpreted), then what can it be blamed on? (The continuing decline in the size of the not-fished Northern cod also discredits stock “overfishing” as the driving force in diminishing fish size - since cod fishing has stopped and the size decline continues...) How could an environmental factor like pollution, climate change, UV radiation level, or physical habitat destruction allow the survival of 3 year old cod, for instance, while being 100% lethal to 6 year olds? ...And seals? How could seals, which are known to preferentially eat smaller fish (20 - 30 cm long)...how could they possibly devour the entire population of five foot wide barndoor skates?! The single factor that makes a bigger cod or other fish more vulnerable than a smaller one is where in the web they must necessarily feed. None of the other theories are credible as selective killers of big fish. There is a food shortage in the sea, and surviving at the higher trophic levels is becoming increasingly impossible for fish, especially on the offshore banks. While reading about the many stocks that are exhibiting constantly reduced age ranges, it is not uncommon to encounter a positive note like this: “the 1998 year class appears to be exceptionally strong” - this of course is based on a survey when they are one or two years old - and too many times it becomes just another “unexpected” failure as it quickly fades away when the “year class” tries to grow up. A high number of juveniles may be just another reflection of the dropping average trophic levels in the sea, one aspect naturally being a shortage of their natural predators. How does a fish actually slide into extinction? Possibly it’s with “an exceptionally strong year class” that starves to death before it reaches the age of maturity? ...In any case, we’ll know soon. I have described this trend before. “Better inshore/worse offshore” is epitomized by the Northern cod stories, but is also widely evident in others both on the East Coast and the West Coast. When the same animal normally lives in both inshore and offshore locations, the argument becomes stronger. 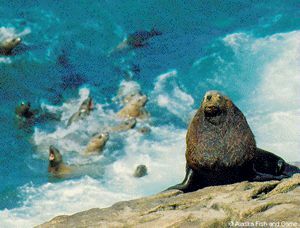 A prime example on the West Coast today is the case of the Steller Sea Lion (photo: ADFG). These fish-eating marine mammals live along the coast of Alaska. The sea lion habitat area includes the continental coastline of Alaska as well as the Aleutian Islands - a chain of small islands that extends very far out into the North Pacific ocean. There has been a fair amount of media attention in the last couple of years covering the dramatic decline that is being experienced by the western end of the steller sea lion population. It appears that they are starving, and the population has undergone a very steep drop in numbers. In contrast, the steller sea lions living on the coast of the mainland seem to be maintaining their numbers fairly steadily. Not really a mystery, this can easily be explained by “better inshore/worse offshore,” starvation becoming more severe the farther away one moves from the source of nutrient input (the freshwater drainage from the mainland - the Aleutian Islands are much too tiny to offer a significant contribution). Changes in the ranges occupied by fish stocks start to make sense when viewed in this light. Reading through the scientific reports on East Coast fish, I constantly encounter this theme. Examples: pollock - 3Ps - recruitment shows “positive signs inshore,” American Plaice - 4T - “this stock has been increasingly concentrated in the eastern part of 4T in recent years” - this flatfish stock lives in the Gulf of St. Lawrence and appears to be at an all-time low, and a look at the map indicates “why” it might move to the eastward, a move in that direction puts it more directly into the path of the outflow of the St. Lawrence River. One last comment on the “inshore” advantage as it applies to cod: recently acoustic studies have been done to determine where the fish are concentrated. 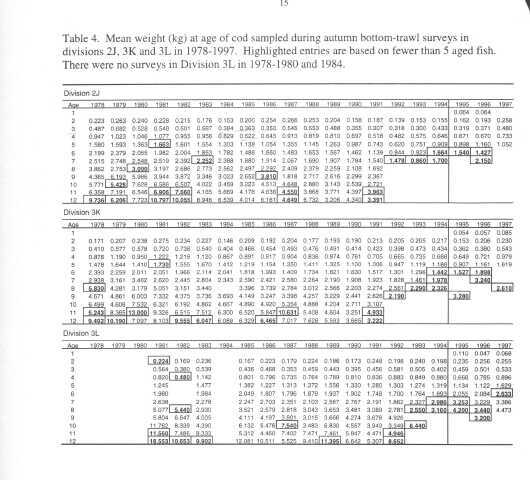 Look at this document from DFO, it includes good maps, “Distribution and abundance of Atlantic cod from an acoustic survey of Bonavista Bay - Trinity Bay, Newfoundland during the fall of 1999" The only “substantial aggregation of cod was detected in Smith Sound, Trinity Bay” - a look at the map indicates that Smith Sound is about as far INSHORE as a codfish can swim. I have already described this particular change in fish (under “More Tough Puzzles”). It is another absolutely widespread pattern, and the scientists have certainly been aware of it and making attempts to explain it. Nothing much has been offered as explanation for this, other than the suspicion that it must have been caused by an “environmental” factor. “Poor environmental conditions.” True, the fact that all fish are affected suggests something systemic, but the investigation into suspected “environmental factors” has not turned up one that is plausible or convincing enough to explain the severe and persistent downturn in the health of the stocks. I also think that the cause can be described as an “environmental factor,” but it’s one that has received no attention yet: systemic, overall biomass depletion. Studying one fish species at a time will not reveal this, and by and large that is still what our scientists are doing. Those looking at “environmental factors” still seem to be investigating the standard list - water temperature, salinity, etc., including searching for connections to obscure long-term weather patterns like the “North Atlantic Oscillation.” Those are doubtless worth looking at, but so are the points that I have made. Fish now have a tendency to reach sexual maturity and reproduce at younger ages/smaller sizes than they did in the past. This is another well known and documented trend, and another puzzling change in fish stocks. When I first came across this one, I didn’t believe it - what I wrote in 1999 was that I suspected that errors had been made in “ageing” stunted fish, that an actual lowering of the age of maturity was most unlikely. Now I know that I was wrong about that - there is overwhelming evidence that the age of maturity has indeed been dropping in many, if not all, fish stocks. This can only be stated with certainty in species where ageing methods have been developed, but in the others it is strongly inferred by the appearance of roe in smaller fish than ever before. Why would stressed fish stocks mature at increasingly early ages? It’s another tough one. It was noted decades ago that cod on Georges Bank, for example, grew much more quickly and matured faster than cod farther north, like those on the Grand Bank. It is likely that warmer water temperature provides part of the explanation since fish like cod clearly do “feed better” in the warmer conditions. On Georges Bank cod always grew bigger, faster than they did farther north. When they get bigger the rate of growth slows down. I wonder if it - the trigger for puberty - has something to do with the growth rate. When growth slows to a particular rate, as it does when fish begin to reach the larger sizes...maybe that somehow triggers the diversion of energy into reproduction instead of somatic growth. Maybe now that growth rates are slowing overall, the trigger kicks in earlier(?) Just speculation, mind you, I do not claim to understand or be able to explain this one. However, neither do the other theories. As for myself, I have spent several years investigating these problems and have gathered enough supporting evidence to “prove” that my ideas deserve a serious look. In 1999 I self-published “Wake Up and Feed the Fish! - A New Insight into the Causes of the Collapsing Fisheries” and sent umpteen copies to scientists and fisheries managers in an attempt to start a debate. A year ago I made this website dealing with the same issue ....what I have been trying to do is “reverse the burden of proof” from myself to the recognized specialists in the field. But it’s proving to be a very difficult thing to accomplish. I’ve received a lot of interesting feedback from scientists and others...but no-one seems to want to REALLY investigate the problem...could it be that no-one wants (or “dares?”...or “is permitted?”) to rock the boat quite that hard? I have had some helpful feedback from the director and others at the Bedford Institute of Oceanography, but feel that the question has not received the serious attention that it deserves. It is possible that I am seen as naieve and not “qualified” to comment...but the experts are now openly admitting that they, themselves, do not understand what is going on. And regarding the FRCC. I have seen them criticized as being “industry dominated.” And I also suspect that may be true. But I have found that just because a person’s livelihood depends on fisheries, he will not automatically be resistant to ideas like mine (which are very threatening, no doubt). It was one of the “industry” representatives that invited me to speak to the council. And he is not the only one who has told me that he is more interested in knowing the truth and preserving something for the future, than he is in pushing up today’s quotas regardless. So, Mr Dhaliwal, that’s the major issue as I see it. The ever-worsening weakness in the marine science must be dealt with - it’s time for a complete shift in thinking, scientific investigators must become...or be given permission to become...more open-minded and consider all possibilities, regardless of how unpleasant they may be. I have tried to give you some specific “pointers” and I hope you find this helpful.